A well-meaning friend of my mother asked me the question many years ago and I had to think about it. In those days, if you were a boy, the common accepted answer would have been fireman or policeman. More often than not, little girls, being put on the spot, responded with social correctness by choosing nurse, teacher, mommy, or if they were dreaming big, ballerina. When I was a little older I might have secretly confided that I would like International Film Star or World Famous Explorer added to my resume. But this was a time when I had only seen the movie, Dumbo, and I hadn’t yet read “I Married Adventure” by Osa Johnson (and wanted to be her). 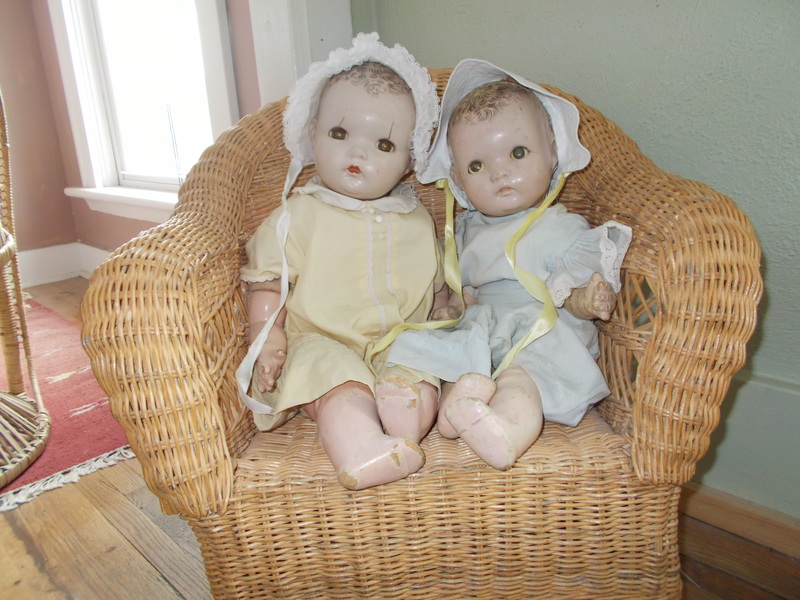 I never coddled my dollies, drilled them on their numbers, or pretended to burp them. But I did regularly prop them around in a semi-circle, Melsina and Marcella, the large baby dolls, in the choice rocker in the middle.Teddy and Jocko, the Australian koala bear, snuggled at their feet. Nurse Jane had to be propped on the side of the chair because her legs didn’t bend. Leilani, in her green grass skirt, and Elizabeth, the very proper English girl, sat together because they were unlikely but bosom chums. Beloved Belindy completed the grouping with the Raggedys, of course, sprawled in front. When they were quietly assembled, I sat on a small stool and opened a book. I hadn’t learned to read yet, so I turned the wondrous pages and told the stories of what I saw – tales of being bundled in bed with a stuffy nose, kept company by miniature creatures who trounced among the covers and burrowed about the pillows; the adventures of a golden haired maiden who rode in a chariot pulled by sweet tabby cats, up and over the rainbow; a winter world of icicles ruled over by a beautiful but scary queen. Eventually I learned to read and write and proudly shared my stories, written painstakingly in pencil on lined notepaper, and as the years passed I filled up many notebooks and read my tales to others beyond my little group. All these years later, in retirement and after many different jobs and wearing a multitude of hats, I find myself in our upstairs office/all-purpose room, where whatever doesn’t fit in another part of the house is deposited. To my left sits Melsina and Marcella in a child’s rocking chair, Nurse Jane and Leilani and Elizabeth are propped about, Teddy and Jocko are on the bookshelf and the Raggedys are nearby. I sit in the middle, typing away on my computer keyboard, telling tales. I know just what I want to be when I grow up. This entry was posted in enchantment, Favorites Books, IMAGINATION, memories, playtime, STORY TELLING, writing. Bookmark the permalink.